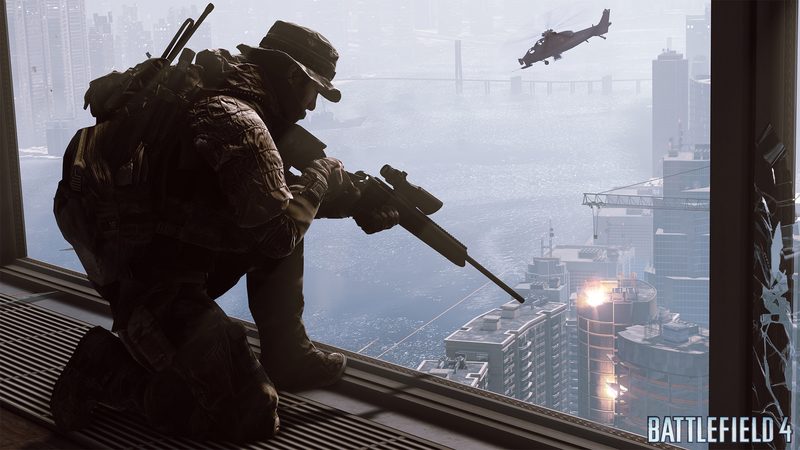 Battlefield 3 has remained one of the best first-person military shooters this generation in my personal opinion, so when EA announced Battlefield 4 I struggled to think how they could make the game even better than it already is. Judging from the story mode gameplay shown at the Microsoft conference it seems like Dice and EA have already outdid themselves. I got a chance to play the multi-player demo which was shown during the EA conference, and after playing I can honestly say it’s one of the best experiences I’ve had at E3 2013 so far. We played the map Siege of Shanghai which features the collapsible skyscraper. The skyscraper is more than just a set-piece destruction too. A team can take over the building and use it as a tactical spawn point, giving them a huge advantage over the match. To counter this, the opposing team can either fight to take it over, or bring down the whole building by taking out the support beams. The map also supports use of Tanks on the street level, choppers, and battle ships in the river. Overall I loved the layout of the maps, the location of the bases encourages players to be strategic instead of just running around trying to gun everyone down. The distance between bases means you’re better off rolling in a vehicle with your squad, unless you know how to be effective on foot. Combat feels as immersive as ever in Battlefield 4, and if you are a run and gunner like me it’s much easier to get to the action thanks to the brand new spawn map and commander mode. Speaking of which, during my 64 player demo two Dice employees played the role of commanders via their control stations to the side of the floor. The way commander mode works is that you can instruct your team via a map on what approach to take, and a squad will earn extra XP for accomplishing these commands. For example, your squad might be close to ‘zone A’ which is currently under attack. The commander can prompt the squad to do what they’re supposed to do and defend the zone. The zone will then show up as a green marker on their screen, directing their attention towards the zone instead of a further destination. This is great for inexperienced Battlefield players, as it will eliminate the chance of them wasting time traveling when they can be productive to the team victory at a closer destination. Modifying classes is more streamlined, and it takes fewer clicks to get into. From the spawn map only one click is required for you to enter the class modify feature. Primary weapons now how four attachment slots, with the extra one being reserved for iron sights and magnification options. The interface is a lot less confusing than in Battlefield 3, and the new layout compliments the great looking menu interfaces. So far I am very optimistic about Battlefield 4. I feel like Dice and EA are doing a great job balancing the game so that it attracts both casual shooter gamers, and dedicated Battlefield veterans. It may not deplete Call of Duty: Ghosts numbers anytime soon, but in terms of overall quality I believe Dice have already surpassed any competition in the military shooter genre. I believe the only thing that will let down Battlefield 4 is if the single-player turns out to be dull. Keep checking out The Koalition for more updates on Battlefield 4.